I love reading to my kids anytime of day. It is such a great way to bond and relax together and it is always nice to read a book with a positive message or great life lesson. That is what the books written by Tali Carmi do, they all seem to share such heart warming and helpful lessons that we all want our kids to learn. This particular book teaches kids to embrace adventure and discovery. It helps kids to accept new cultures and people in a foreign place. 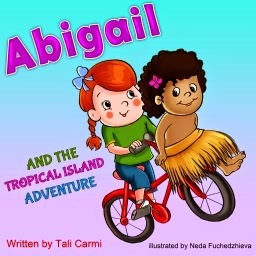 Your kids will enjoy full-color illustrations of Abigail and the tropical island. Abigail and the Tropical Island Adventure is a sweet children's book written especially for you and your ages 2- 8 children.